Fastrax manufacture a full range of belt conveyors to suit most applications however we can supply much more to meet all your requirements. Check below for the main products we can also supply with links to their relevant microsites containing more detailed information. If theres anything you can’t see please feel free to give our sales team a call who will be happy to assist in finding the perfect solution for you. Gravity conveyors manufactured by Fastrax provide a low cost addition to any production, process or packaging line. We offer a full range of lengths and sizes to suit your requirements, with roller diameters of 20mm, 30mm, 50mm and 63mm, standard or heavy duty where applicable and can generally be supplied in PVC, mild steel or stainless steel to suit the environment. The frames can also be manufactured from mild steel or stainless steel which makes them ideal for the food industry. We can also supply roller tracks, micro tracks and ball tables to compliment the gravity roller range. 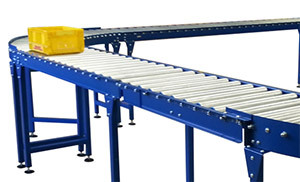 Driven roller conveyors manufactured by Fastrax offer versatility for the the transport and accumulation of unit loads whilst remaining quiet and energy efficient. We provide 3 main variations to suit most requirements. The 24v driven rollers can have separately controlled zoned accumulation to only provide drive when required making them an excellent material handling solution. The lineshaft conveyor uses a rotating shaft which powers friction spools to rotate the rollers which make it ideal for low pressure accumulation while the chain driven conveyors are more suited for heavier loads such as pallet transportation. 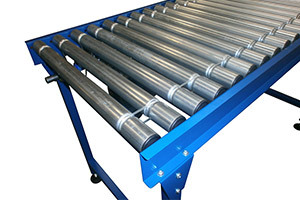 Visit our main site for more detailed information on our full driven roller conveyor range. 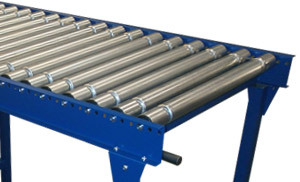 Our range of rollers can be manufactured from mild steel, stainless steel or PVC and includes rollers for gravity/driven conveyors, line shaft or pallet rollers. We supply rollers in diameters from 20mm up to 102mm to cover all standard and heavy duty applications. Different bore sizes are available and shaft variations including fixed/spring loaded, flatted, female threaded or cross drilled. Our sprocketed rollers designed for driven conveyors can be supplied in 11, 14 and 15 tooth options with the 15 tooth variant support loads of up to 250kg. 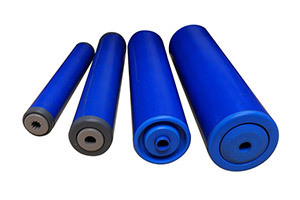 We can supply simple one off rollers as simple replacements to existing conveyors or thousands for a new build system at highly competitive prices on quick delivery. Visit our main site for more detailed information and specification on all our rollers and to purchase them direct online.